Osaka Prefecture (大阪府, Ōsaka-fu) is a prefecture in the Kansai region of Japan on the island of Honshu. The capital city is Osaka. Osaka prefecture was created by merging the area of Kawachi Province, Izumi Province and Settsu Province. In 1994, the Kansai International Airport opened. This is one of the main international airport hubs of Japan. 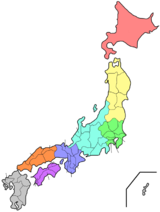 Osaka Prefecture has borders with Hyōgo Prefecture and Kyoto Prefecture in the north. Nara is west of Osaka. Wakayama Prefecture shares the prefecture's southern border. The west faces Osaka Bay. The Yodo River (淀川, Yodo-gawa) flows through the prefecture. Hiraoka jinja, Ōtori jina, and Sumiyoshi taisha are the chief Shinto shrines (ichinomiya) in the prefecture. ↑ Nussbaum, Louis-Frédéric. (2005). "Osaka-fu" in Japan Encyclopedia, p. 759; "Kansai" at p. 477. ↑ Nussbaum, "Osaka" at p. 759. ↑ Nussbaum, "Yodo-gawa" at p. 1053.